The Birkebein party: formed in the mid 1170’s, as a rebellious political party which main motive was to stop the transition of power from Trøndelag, to the Westcoast and Southeastern part of Norway. With King Sverre Sigurdsson, the most well-known of the Birkebein kings, the party came to power in 1177. The Bagler party: formed in Skåne (then part of Denmark) in 1196 by Bishop Nicholas Arnesson of Oslo and Archbishop Erik Ivarsson of Nidaros. Consisted principally of the Norwegian aristocracy, clergy and merchants, and fought against the Birkebeins during the Norwegian Civil Wars (1130-1217). These had the support of the Danish kings, while the Birkebeins, who reigned in Trøndelag and on the West-coast, received support from Sweden. 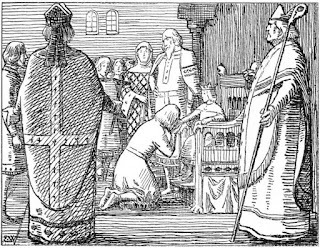 When Innocent was pope, the third of his name who reigned in the Apostolic See, something happened in the Northern lands, recounted in the saga of Haakon Haakonsson, son of King Haakon Sverresson. At that time, 1203 winters had gone by since the incarnation of our lord, Jesus Christ; Valdemar Valdemarsson was king in Denmark, Sverke Karlsson reigned in Sweden, King John Lackland in England, and King Haakon Sverreson in Norway. It was one year after the passing of King Sverre. That winter, King Haakon had taken his seat to Trondheim; when spring came, he traveled south to Bergen, where he had a brief stay before he sailed south, followed by several eminent men. After many months of travelling, the king finally had a longer stay in Borg (today known as Sarpsborg) during the fall of 1203. At that time, there was a woman with him named Inga, a gentle and honorable being; she was of a good family, and she had many good friends in Borgarsyssel (today known as the county of Østfold). Inge stayed in several of King Haakon’s residents, as well as sharing his bed, a known circumstance to several of the king's trusted men. After some time, King Haakon traveled from Borg to Oslo, and further west. Queen Margrete, who had been married to King Sverre, and their daughter Kristin, followed him from Oslo. Before Christmas, they finally arrived in Bergen, where the king threw a huge feast. That same winter though, Haakon suffered a severe illness which eventually led to his death, and he died on New Years Day, 1204. The following summer, the Baglers had gathered in Viken in southeastern Norway, where also the Danish king and Bishop Nicholas resided. Little did they know that Inga, the mistress of the late King Haakon, was in Borgarsyssel, on a farm called Folkenborg, where she gave birth to a baby boy. A priest named Trond knew that King Haakon Sverresson was the father of the boy, and went to a man named Erlend, who had been a kinsman of King Sverre. They agreed that as little as possible should be let known about the child, and Trond priest consequently baptized and raised the boy in secret. The next winter though, Trond and Erlend left Borgarsyssel, with intention of going to the county of Oppland, and they were joined by the little prince and his mother Inga. On Christmas Eve, 1205 they eventually came to Hamar, a merchant town in Hedmark. There they met two men, Fridrek Slafse and Gjavald Gaute, who were sheriffs of the Birkebeins. They were accompanied by many men, and had to constantly be on guard, as Baglers resided throughout entire Oppland. At that time, Ivar was bishop of Hamar, and he was, as he had always been, a great enemy of King Sverre's descendants, and of all Birkebeins. Despite the fact that they traveled quietly with the boy, the bishop nevertheless found out that the prince was underway. He bade the boy and his mother to his residents at Christmas, stating that there was kinship between them. But the Birkebeins did not trust the bishop, and declared that the boy and his mother were tired after the journey; therefore, they would rather come over after Christmas. However; as soon as the Christmas dinner was over, the Birkebeins got a hold of three horses, and quickly brought the boy and his mother to safety; in Lillehammer, well hidden on a small farm, they stayed until Christmas had passed. During December, the Birkebeins had sent word to all the villages around, and summoned all of the nearby Birkebeins immediately after Christmas. 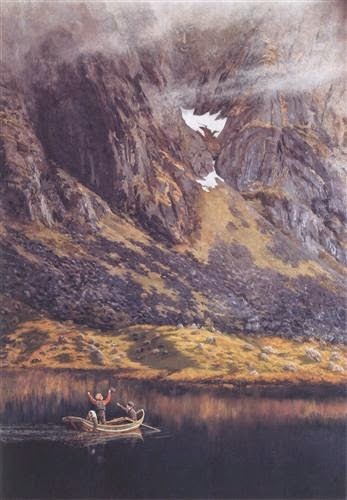 Through Østerdalen, they escorted Inga and her baby boy, with aims of eventually reaching Nidaros. 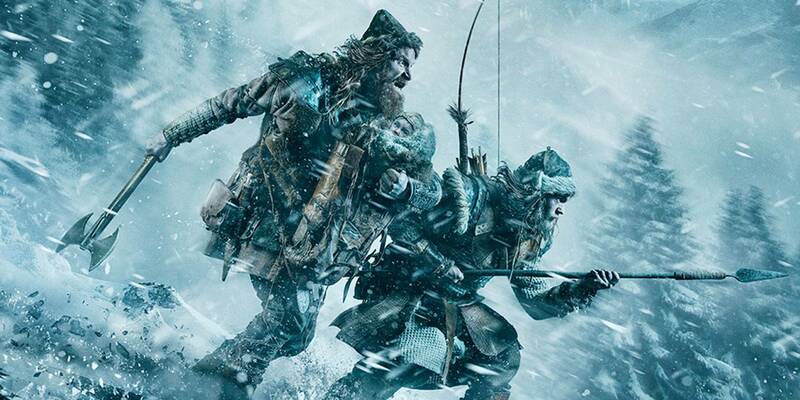 It was a laborious journey, as they got a lot of bad weather and frost and snow. Sometimes they also travelled at night, through forests and wastelands; one night the weather got so bad, they lost track of where they were. It was then decided; the two most skilled men at skiing were to take the boy with them. Their names were Torstein Skevla og Skjervald Skrukka. Through a Norway in disunity, deeply affected by 75 years of by civil war, a dramatic and dangerous escape came about that would influence the nation during the hundred of years to come. 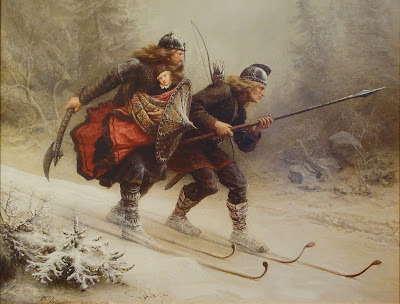 Over the mountains, in rough weather, constantly on the move, the Birkebeins Torstein Skevla og Skjervald Skrukka fled from the Baglers, carrying with them the one year old Prince Haakon Haakonsson. The Civil war period in Norway had started after Sigurd the Crusader's death in 1130, and continued with a series of dynastic struggles within the established patrician families. The group with the peculiar name of the Birkebeins (eng. “Birch legs”) first appeared in the sagas in 1174; as they largely consisted of poor people, they – in lack of better footwear – had to wrap birch bark around their feet in order to keep warm. 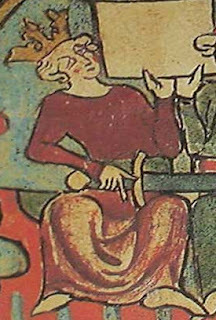 Coming from the bottom layer of society, the group rebelled against the existing ruling class, represented by the wily Earl Erling Skakke and the Lendman Party; though never actually being king, Skakke still functioned effectively as one, as he in 1161 succeeded in getting his five year old son, Magnus Erlingsson, on the throne. By making sure that any possible contenders were eliminated (including his own stepson), Skakke managed to remain in power in the years to come. Nevertheless, the Birkebeins suffered a major defeat against Erling Skakke and his allies in the battle of Re in January 1177, which also would claim the life of the 19 years old Eystein Meyla. This did however, not represent the end of the the Birkebeins; within the next few months, they had found a new leader. The choice had fallen on the slightly older, and far more charismatic, Sverre Sigurdsson. Together, Sverre and the Birkebeins proved to have a remarkable ability to boost morale, and to mobilize supporters for their roving warfare in the years ahead. After the fall of Erling Skakke in the battle of Kalvskinnet in 1179, the Lendman Party lost its most important strategist. Five years later, they also lost their king, when Magnus Erlingsson fell as the Birkebeins overpowered the numerically superior forces at the Battle of Fimreite, on the 15th of June, 1184. With over 5000 men taking part, it was the greatest battle during the entire Norwegian middle ages – never before had so many men been killed in battle. With tremendous ferocity and rage, the Birkebeins attacked, outright slaughtering more than 2000 of King Magnus’ men – nearly the entire army were wiped out in Fimreite. Consequently, this battle contributed to wiping out much of the existing ruling class. The few who remained were soon displaced by the man who took the name King Sverre. The former insurgents had become the country's undisputed rulers. "At Fimreite". 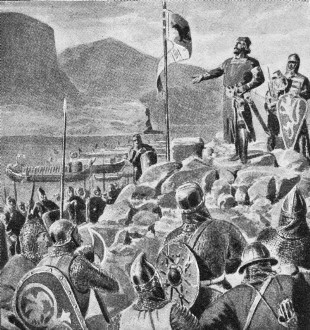 Sverre speaks to his men before the battle. Illustration from 1926, artist unknown. Although the battle of Fimreite entailed a crushing defeat for the established aristocracy, the surviving leaders of the Lendman Party resumed their fight to regain power through their alliance with the Danish king and the papacy. At safe distance in Skåne, they reorganized themselves, and took the name the Baglers in 1196. During King Sverres final years, this group ultimately constituted a growing military challenge, and after his death in 1202 they reinforced even further. 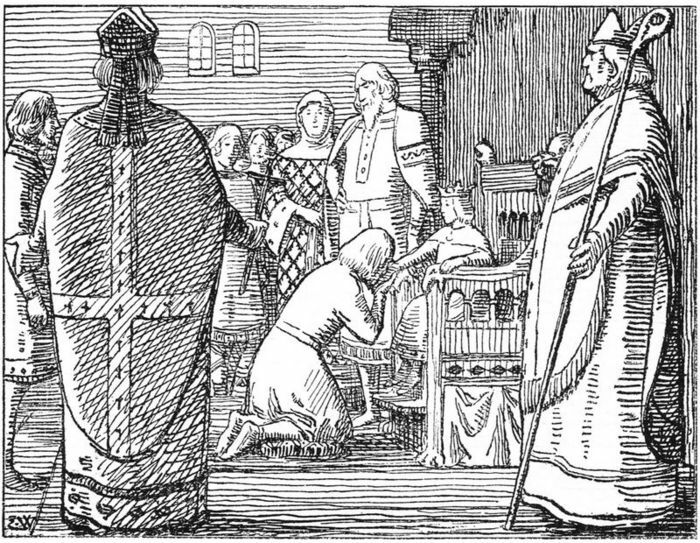 After taking the throne after his deceased father, the son of Sverre, Haakon, tried to reach an agreement with the Baglers and the papal church. 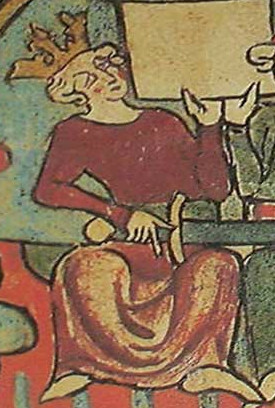 However, as the saga proclaimed, King Haakon Sverresson died only 21 years old in Bjørgvin, January 1st, 1204 – perhaps poisoned by political opponents, supposedly in alliance with Margareta Eriksdatter, his own stepmother and the widow of King Sverre. The young king's death triggered of a flare-up of the old civil war and with it, Haakons still unborn son came to be one of the most important pieces in the game of Norway. The summer of 1204, Haakon Haakonsson as born into wedlock by his father's young mistress, Inga. 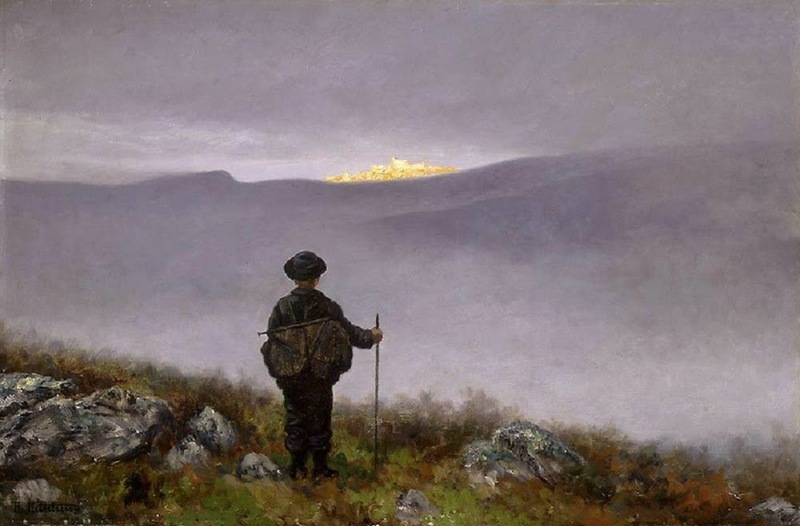 The boy’s royal ancestry appeared to have been unknown among both the Baglers and the Birkebeins, which could only help to explain how the son of the deceased King of the Birkebeins came out of his first year alive, in a situation where the Baglers controlled most of eastern Norway. However, during the fall of 1205, the significance of the little prince would become well known throughout the realm. In January 1206, escorted by a company of Birkebeins and continuously pursued by Baglers, the 20-year-old Inga and her baby son fled from Lillehammer in hope of reaching Nidaros. 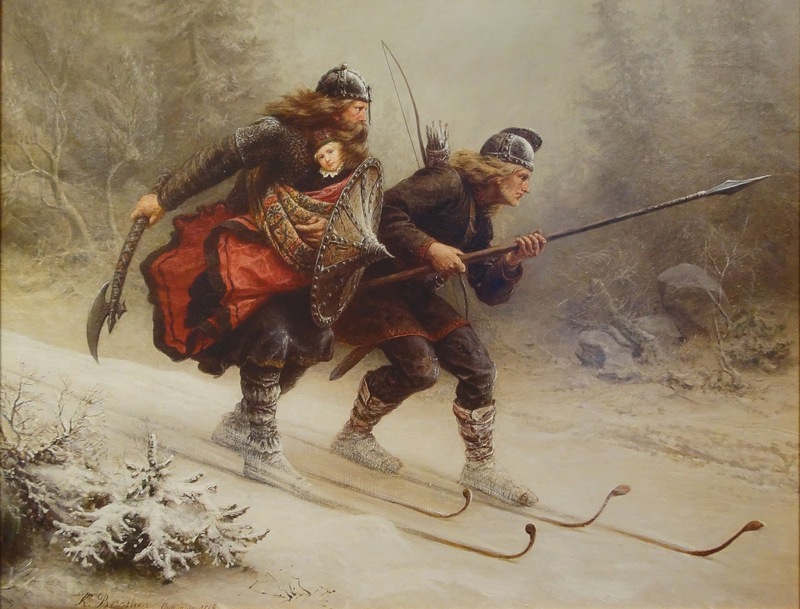 However, when hit by a massive storm, the Birkebeins did not dare to wait for it to subside, and therefore sent their two best skiers ahead, through the storm carrying with them the little heir. Little is known about what actually happened next, other than that the journey was overly dramatic, characterized by heavy snow, extreme cold and rough weather. The two men had small chances of feeding the boy, other than with snow which they melted in his mouth. The Birkebeins however, fought their way through the storm, with no thought of either turning back or giving up, but to save the child who they hoped would become the king. After much ado, the trio finally reached Nidaros, the “capital” of the Birkebeins, and the city known today as Trondheim. Haakons granduncle and the governing king of the Birkebeins, Inge Bardsson, acknowledged Haakon as prince, and agreed to maintain the rule in his stead. In 1208, Inge came to an agreement with the Baglers, letting their king Philip Simonsen have control over the Viken-area around today's Oslo. 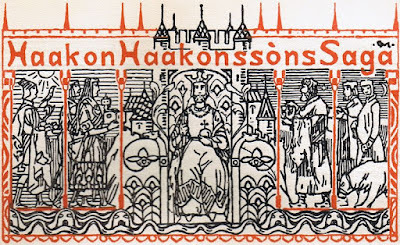 After both Inge Bardsson and Philip Simonsen died in 1217, the 13 year old Haakon Haakonsson finally became the King of Norway, the fourth of his name, acknowledged by Baglers and Birkebeins alike. After many years of great turbulence, Norway got what we today would call "political stability." Under Haakon Haakonssons rule, the nation was finally united, simultaneous as its territory was greatly expanded. During the last three years of Haakons life, both Iceland and Greenland became part of the Norwegian realm. He came out victorious from all of the military conflicts to which he was challenged, and became a unifying king in the sense that he conducted reconciliation, both with the remains of the Baglers, as well as with the church. A highlight of the process came in 1247, when also the papacy formally acclaimed him as king. 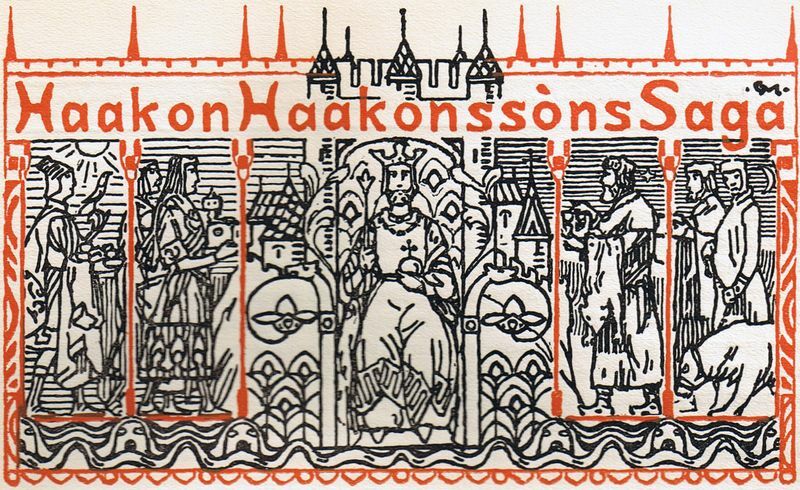 Although it remains unclear whether this progress was exclusively of his own doing, one can still safely say that Haakon Haakonsson became the king who ended a civil war period which had lasted over a hundred years. Haakon became the leader which the Birkebeins in 1206 had hoped that he would become - and that the Baglers had feared – if and when he survived. Depiction of Haakon IV, King of Norway in Flateyjarbók. Norway stands in 2016 outside the European Union, and is in many ways a divergent country even in a Western European perspective. The country is still characterized by a more scattered population and fewer social differences than most other countries, largely due to the fact that Norway was never heavily influenced by the aristocracy, as opposed to in the UK and Sweden. In turn, this was probably much due to the Birkebeins victory over the established nobility and its royal family during the civil wars of the late 1100s and early 1200s. Of course, chances are also that Norway would not have looked so much different, even though Haakon Haakonsson had not survived the escape, 810 years ago. But all indications point to the fact that we then would not have Birkebeinerrennet (eng. “The Birkebeiner race”), an annual long-distance ski- and bicycle marathon commemorating the escape in 1206. In turn, skiing would not have to same significance that it has in Norway today. That would in itself have changed something about how Norwegians perceive themselves, and how they are perceived by other nations. Hence, besides the short-term political significance for the outcome of the Civil War, one might say that the Birkebeins also had a wider impact, which in the long run, in various ways, characterizes Norway even today. 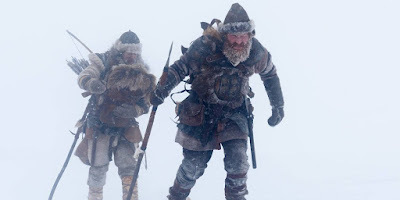 Last but not least, there would not have been made a movie about the Birkebeins and Haakon Haakonssons escape in 1206, which certainly would be a great loss for all history buffs and moviegoers. Being worldwide released during 2016, it depicts an imaginary course of events inspired by the saga, contributing to a renewed attentiveness to this captivating part of history. Karsten Alnæs (1996). "Det ligger et land". 1st volume in Historien om Norge. Gyldendal Norske Forlag: Oslo.